To begin, I’d like to extend my deepest thanks to everyone that supported and volunteered their time to help plant this past year’s 5-acre restoration area! It truly was a great undertaking, and with everyone’s help, it has thus far been a huge success. 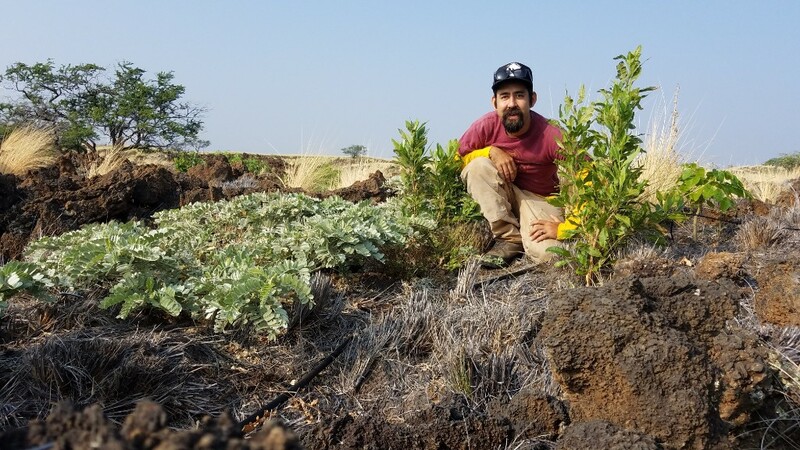 This has been my second year of planting since joining the Waikoloa Dry Forest Initiative’s staff, and I am still very humbled and left in awe by this amazing community that dedicates so much of their time and resources to enhance these dryland forest ecosystems. This year’s planting area was especially challenging, with its jagged a’a substrate and seemingly few pockets of soil, yet has proven to be quite suitable for the native plant species that now live there. In total, we planted a variety of 24 different plant species, including 9 types of endangered species. Overall, from November 2017 to April of 2018, we were able to plant over 1500 native plants across the 5 acres with roughly 75-80% of them surviving through the summer. Each year, we give a name to restoration area that we’ve been working on, and after much thought, the 2017/2018 planting area has received its name- Hālāwai. In one meaning of the word, Hālāwai refers to the horizon line, a place where the earth and sky meet each other. From our pavilion area, the Hana Hou Hale, the interior portion of the planting area raises up and forms one of the more prominent horizon line features on the landscape, so we’ve always considered this area of the preserve to be “on the horizon”. In another sense of the word, Hālāwai can also mean to meet or to have a meeting, and on a more personal note, this is where the name truly resonates with me. When joining the WDFI team two years ago, I bore witness to the great coming together of the community. It was inspiring to see such a passionate community come together to accomplish our shared vision of forest restoration. This year, I have felt as though I have actually joined that community. Through all of the volunteer planting, trail making, and service days restoring the area of Hālāwai, I got to meet with so many members of this great community and connected with many of you on a much deeper level. It is with the utmost gratitude that I thank Hālāwai and the Waikoloa Dry Forest Preserve for providing the space in which these great connections could be made. Once again, thank you to each and every one of you for making this great project possible. Also, I’d like to thank our Executive Director, Jen, and the WDFI Board of Directors for being the great stewards that make our shared dream become reality.